It’s important to understand that when you’re having your roof replaced, your home becomes a construction site. There will be roofers on, inside, and around your house. Your home might feel a little hectic for a few days, and yes, things will be messy and loud. Being mentally prepared for the mess and chaos of living through construction can sometimes be the hardest part of having a new roof installed (or any construction for that matter). Just remember that your roofer wants the job to go just as quickly and efficiently as you do. Luckily, there are a few things that you as a homeowner can do to prepare your for a residential roof replacement. First, the roofing company will deliver shingles, tools, and other supplies. They will probably bring a dumpster to your driveway for disposing of rubble and other debris. They might also bring a port-o-potty so they don’t need to go inside your home to use the bathroom (and in the process, bring the mess inside). The roofers might cover up trees and other plants in your yard to protect them from debris. It’s common for debris to drop in the attic or the area outside and around your home. The roofers may be using brooms, wheelbarrows, shovels, and other tools to prepare the substrate for a new roof, and this can get pretty loud. The noise level depends on what kind of roofing material is being used. Shingles that need to be nailed down will cause more noise than other kinds of roofing materials. 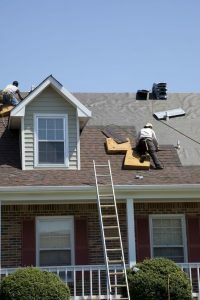 When the project is complete, the roofers will clear the roof and the area around the home of debris. They will remove any tools and unused building materials, and they will check the area for any nails that have fallen into the yard. Preparing the space around your home for the delivery of materials can be a huge help to the roofers. There will be a considerable amount of waste, so clearing a space (preferably in your driveway, right up to the house) for the dumpster is important. This prevents litter from making it all the way to the street, reduces labor, and makes the job go faster. Making arrangements to park your vehicles down the street or in a neighbor’s driveway during construction is be a good idea. Not only will this make sure there is plenty of space for the dumpster and supplies, but it will prevent your car from being damaged by falling debris. Plan ahead if you need to remove vehicles or anything else from your driveway. Clear the perimeter of your home of obstacles such as outdoor furniture, grills, potted plants, and trashcans. The general rule of thumb is to keep things 20 feet away from the perimeter of your home during roof installation. This gives the workers easier access to the work area, ensures a safer working environment, and protects your property from falling debris. If you have an air conditioning unit or home generator installed next to your house, you may want to protect it from debris by laying a piece of plywood on top of it. If you have a pool, keep it covered until the job is finished to prevent debris from making it into the pool. Finally, children and pets don’t belong on a construction site. For their safety, please make other arrangements for them while the roof is being replaced. There may be a lot of vibration in your home caused by construction. You might want to remove pictures, mirrors, and other fragile objects from the walls. Even though the roof installation is outside, you never know what might get knocked loose during construction. Consider covering your clothing, furniture, and bedding as well. Roof replacement sometimes requires access to the attic. Make sure the path to the attic door is free of clutter and is not restricted. Show the project manager the way to the attic so the workers can access it if needed. Lastly, clear communication with your roofing company is imperative. When you choose E3 Roofing and Remodeling, you’re choosing a company that’s committed to providing outstanding service. We use high-quality materials and treat your home like it’s our own. Contact us today!